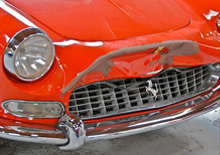 Collision repair is one of our expertise's. Our customers depend on us to handle all aspects of the repair. We work with the client and insurance companies to provide the best of both worlds. The client's complete satisfaction in a timely manner, and the insurance companies desire for a top quality job, and a very satisfied customer. One thing we strive for at Perfect Reflections in respect to collision repair work, is for the car to be brought to it's former self. Only your body man will know for sure. 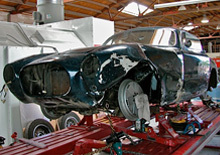 We begin with state of the art equipment, and the best collision repair technicians in the business. We have perfected our color matching technique with an exact match of color and texture of the original manufacturer. Our knowledge of the cars and techniques of the period in which the car was built, assist us in achieving the correctness for a collision repair that should be undetectable. At Perfect Reflections attention to detail is what has earned us our reputation. When our expert craftsmen complete the repair satisfaction is guaranteed!